One product I’ve reviewed on this blog that seems to be quite popular is Ikea’s chocolate oat ball. This is a wonderful delicious sweet and easily worthy of a candidate for my top 10 sweets. I’ve received a comment asking for the recipe of a similar treat which was distributed at Ikea. I haven’t been to Ikea recently and didn’t pick it up when I was there, but when I sent an email to them I got a response with a PDF scan of the original recipe. Comparing the ingredients it’s clear it won’t taste exactly the same, but someday I hope to try it out. One great thing about homemade sweets is you can adjust the amount of sweetness to your taste. If anyone makes this, please give me a picture and full report on the test! For those of you following Sweet’s Reporter, you may have realized that I haven’t posted in quite some time. Truly, it’s been over 4 months since my last post, since I’ve been busy with another blog project and other things. I’ve also been having mostly the same old sweets, so I didn’t have much to report – excepting the products I tried that weren’t really report-worthy. I recently got my hands on Taza’ Organic Coffee Chocolate Mexicano, and to be honest it’s almost like a new class of chocolate to me. The ingredients are suspiciously simple, containing the trio of cacao beans, cane sugar, and coffee beans (all organic). There is 55% cocoa content. The disc shape of the chocolate caught my eye, but whats really great about this product is the texture. The package declares it is “stone ground”, and normally I’d write off such marketing speak as a desperate attempt to sell a product in a hyper-competive market. The discs texture seems pretty typical from the outside, but after breaking off a piece you can see it’s not quite as solid as other chocolates. Once you sink your teeth into it, you experience something which I can only call decidedly gritty and unlike anything I’ve had before. Letting the it melt on your tongue (my typical way of enjoying chocolate products) enhances the sensation such that I’d like to call up the grounding stones and thank them. What was initially a “strange but unique” texture quickly became an addiction to me. The price of this chocolate is usually around $8.00, a bit on the expensive side for this weight of organic chocolate, but I managed to pick it up for around $5.00 on a sale at Whole Foods a week or two ago. Even if the product is not on sale, I highly recommend chocolate lovers to try this out once. Though the ingredients are exactly the same, this almond butter is very different from Justin’s almond butters. First of all, it’s crunchy which large chunks of almond strewn throughout. Not only does this give if a very different texture, but it reminds me of white chocolate chip cookies which is a big plus. The base itself is a single light brown color, whereas Justin’s products are a mix of various shades, giving them a sandy appearance. 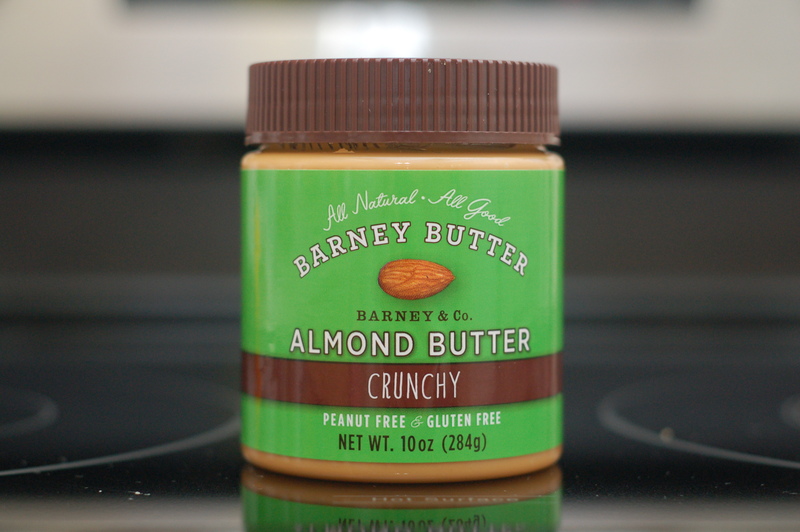 Barney Butter is also much less oilier, which can be a positive or negative depending on how you look at it: spreadability vs over-greasiness. Even though the sugar amount is exactly the same as Justin’s maple butter, I felt Barney Butter’s almond butter to be significantly sweeter. All in all a great taste! Each serving is 2 tablespoons (32 grams) and there are about 9 in the jar. There are 180 calories per serving, with 140 of those from fat. In a serving there is also 80 mg sodium (3% of DV), 3 grams of sugars, and 6g of protein. With no artificial flavors or colors, no preservatives, and no mysterious “natural” flavors, it can’t get much more natural than this. To top it off, evaporated cane juice and sea salt are used instead of their common counterparts. Yes, whether these are actually healthier is in debate, but if I had a choice I would pick these over their more common variants. Full ingredient list: Dry roasted almonds, evaporated cane juice, palm fruit oil, sea salt. I bought a 10 ounce (284 g) jar of this at Whole Foods Market for around $4.99. A great way to get natural protein and all the other nutrients that come packed in almonds, along with a wonderful taste. Highly recommended for those looking for an upgrade for their plain-jane peanut butter. I was looking for something sweet, fruity, and alcoholic, and the colorful frosty bottle of Arbor Mist White Zinfandel caught my eye so I decide to pick it up. I’m no wine expert so I cannot tell you if this is a true ‘Zinfandel’ or not, but judging from the cheap price I doubt it is on any wine connoisseur’s top ten list. This wine’s flavor is what I call very… moderate. It’s moderately sweet, moderately fruity (both smell and taste), and tastes moderately like wine (this is probably because there is only 6% alcohol). It goes down smoothly and it’s quite easy to drink down a whole bottle in a matter of minutes. However if you had other alcohol products available its hard to say if you would choose this one. There are 3 servings per bottle, with each containing 15 grams of sugars and 170 calories. In my rush to pick up something at the grocery store I was fooled by the “Exotic Fruits” labeling and led to believe there is actual fruit inside. That is not the case – there is exactly 0% fruit juice present. The fruit-like flavor comes from various natural sources, which is nice, but not likely to be any real “exotic fruits”. The sweetener is HFCS which is something I try to avoid, but frankly I haven’t yet seen any evidence that proves for certain this is any better or worse than other sweeteners (including non-calorie sweeteners and natural fruit juices). Still, I consider this a minor weak point and plan on looking for a sweet wine that uses real fruit juices in it. If you know of one, please let me know. There is a trio of preservatives I’ve seen used in other wines before, obvious not ideal but probably a necessary evil for most wines. Ingredients: white zinfandel, water, high fructose corn syrup, natural flavors, carbon dioxide, citric acid, potassium sorbate, potassium benzoate, and potassium metabisulfite (to preserve freshness). I purchased this 750ml bottle for $14.99 at Winn Dixie supermarket. This is an OK sweet, fruit-flavored wine if you are buying on a budget, but there is nothing great about it worth going out of your way to pick it up. 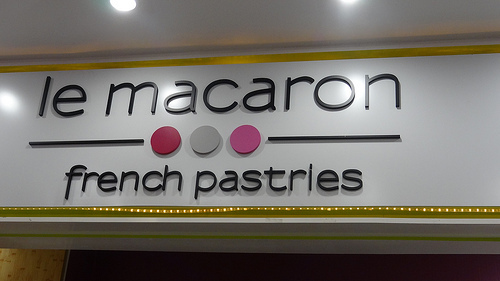 I stumbled upon the “le macaron” store in Tampa’s International Plaza mall on a recent family trip. 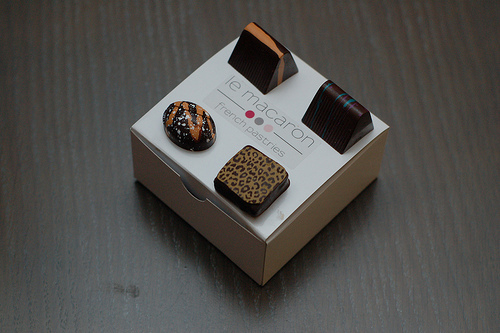 In addition to various flavors of french macarons, there are also fine chocolates sold here. I don’t remember the exact prices, but each of these sells for roughly $2 dollars a piece. We purchased 6 macaroons and 4 chocolates (shown in the below pictures) for around $22. 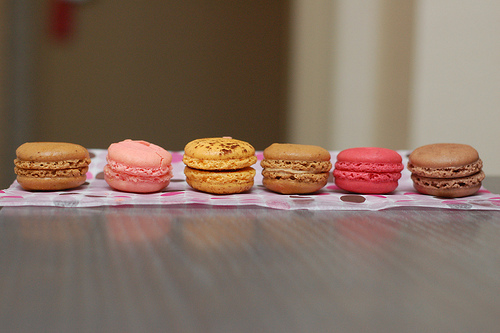 I have only tried macarons once or twice in my life, but the ones at “le macaron” were pretty typical. The rose and raspberry flavors really tasted and smelled like the real thing, but it’s hard to say if that taste is made from “natural ingredients” or the real thing. The coffee-flavored macaron really didn’t taste too much like coffee, so I doubt there much, if any, real coffee present. My biggest issue with macarons in general is that there is always some slightly odd flavor I can’t put my finger on, and that applies to these sweets as well. But if you like macarons I’m sure you’ll enjoy the one’s sold here. The chocolates were very impressive visually, with everything from patterns in the likeness of leopard spots to shiny metallic balls. There was a variety of fillings, including caramel- and fruit-like. While I have to admit they were all tasty, I know a load of sugar when I taste it. Macarons are relatively rare in the world of sweets but chocolates are a dime a dozen, so they have to hold up to more scrutiny. The pretty designs and (typical) good flavor don’t win over the high price and high sugar content. As for the ingredients, I wasn’t able to find anywhere the full ingredient list was published for either product. However, the company’s website (which is a franchise, interestingly enough) states all macarons are gluten free with no artificial flavors or preservatives. This puts them in the mid range of ingredient quality, but I wish they published the entire list. I couldn’t find any information about the fine chocolates. Overall, I feel both product lines are mediocre, but they are tasty enough to try once, and the fine chocolates are novel enough to buy for a friend or family member as a gift. The Internal Plaza is a great shopping center with many stores and restaurants, so if you happen to be traveling in Tampa be sure to check it out, and maybe stop by “le macaron” while you are there. On a recent family trip to Tampa I was looking for something sweet to drink, but without mysterious artificial flavors. 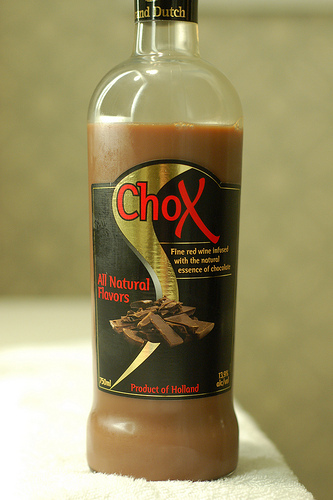 I ended up trying Chox: “Fine Red Wine Infused with the natural essence of chocolate”. Fortunately this product had only a very slight taste of red wine, which is a big plus for me since I am not a big red wine fan. The sweet chocolate flavor really dominates the experience, although the texture is probably somewhat close to a red wine. If you like Kahlua or other sweet chocolate beverages then you will likely love this, and the overall experience is quite similar. I was attracted by the label which stated there are no artificial flavors, and think this the strongest point of this drink, especially when comparing to other sweet drinks like Kahlua which have who-knows-what in them. On the other hand, although everything in this product is ‘natural’, as with other instances of ‘natural flavors’, you really don’t know what is in the product. If this product actually listed everything used to make it I’d feel much better about it. This product also contains sulfites, but from what I have researched they are present in a majority of wines, and have little effect on the body, so they are not much of a concern to me. This product is imported from Holland. I’m not sure what type of impact this has on the taste or ingredients used, but it gives it somewhat of “exotic” feel from a marketing perspective. Ingredients (as listed on package): Grape wine with molasses neutral spirits, dairy cream, natural flavors, and natural carmine color. I bought this 750 ml bottle for $12.99 at a Publix in Tampa, Florida. I was searching for a sweet alcoholic drink with no artificial flavors and some of the health benefits of wine. Turns out this fits the bill perfectly. I can’t speak whether a wine expert would enjoy this or not, but anyone with a sweet tooth who is looking for a little alcohol buzz should definitely try this product out. I was looking for a sweet coffee drink and this seemed to be different than the usual bunch, so I thought I would try it. 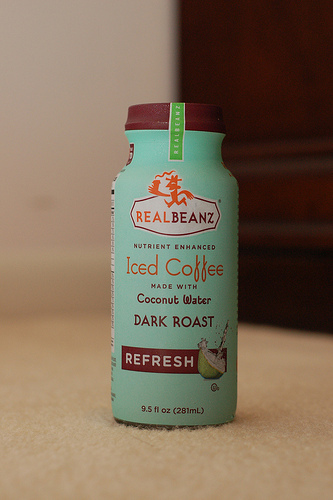 The flavor is very reminiscent of Starbucks Frappuccino beverage, with a strong milk flavor over a light coffee taste. The sweetness is quite subdued, no surprise considering the relatively small amount of sugar. Although 20% of this drink is coconut water, there is little to no taste of it. To me this is a good thing since I’m not too fond of it’s taste. To be honest, the Starbucks drink tastes better, but for the lower calories and sugar (see next section) the minor compromise in flavor is worth it. In one bottle (281 ml), there is 70 calories, 10 from fat. There is also 9 grams of sugars and 5 of sugar alcohol. There’s 2 grams of protein as well. When compared to a similar Starbucks drink, this one has less than half the calories and sugar, even if you include the sugar alcohol, erythritol. Stevia is also used as a (nearly) zero-calorie sweetener. Though there have been some controversies regarding this additive, it seems that currently there are no major known health concerns with it. It may even have anti-cancer and anti-inflammatory benefits. The crypticly named ingredients at the end of the ingredient list are all vitamins. For example, niacinamide is Vitamin B3. There is 25% of the following vitamins in this product: Vitamin A, Niacin, Vitamin B12, Vitamin C, Vitamin E, Vitamin B6, Panthothenic Acid. There are divided opinions on how healthy adding vitamins are, but for those who believe they are beneficial, this drink is a good supply of them. Ingredients: Brewed Coffee (water, coffee solids, coffee extract, reduced fat milk, coconut water concentrate, erythritol, dried cane syrup, sodium phosphate, carrageenan, sodium bicarbonate, natural flavor, ascorbic acid, stevia rebaudiana leaf extract, di-alphatocopheryl acetate, calcium, d-pantothenate, niacinamide, vitamin a palmitate, pyridoxine hydrochloride, cyanocobalamin. I got this for only $1.99 at Whole Foods Market. This product succeeds in its goal: making a product with low calories (70), low sugar, and a reasonably good taste. Add to that a little bit of coconut water and a load of different vitamins and you have a very well-rounded drink. 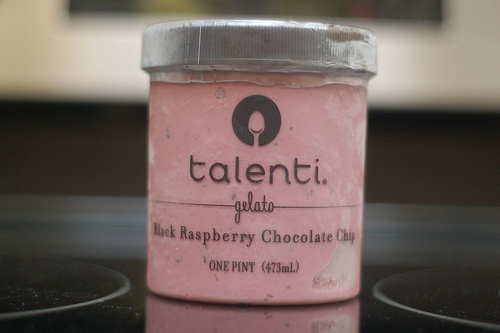 This is my fifth review of a Talenti ice cream, with two of my favorites reviewed here and here. This brand’s chic packaging is what initially caught my eye, but with my first bite I was hooked with each of the sweet, creamy, and natural flavors. This ice cream has all you could ever want – a strong, natural raspberry flavor backed by a creamy, sweet milk texture, and tiny chocolate chips to complete the picture. I’ve mentioned this with many other ice creams as well, but this one especially tastes *really* good when eaten in a half-melted state, like when you scoop your spoon around the perimeter of the container, picking up only the most melted stuff. Focusing on eating the half-melted parts not only maximizes your enjoyment per bite, it also lengthens the time to eat a given amount of volume. A single serving (1/2 cup, 104 grams) contains 230 calories and 24 grams of sugars. These are both somewhat higher than the average ice cream, but typical within Talenti’s lineup of milk-based ice creams. This dessert has very natural and healthy ingredients, and is also gluten free, hfcs free, hormone free, vegetatian, and kosher. There are also no artificial flavors or colorings, or even “natural” flavors, the latter of which are present in a few other Talenti poducts. Because of the calorie and sugar content I wouldn’t consider this a diet product, but the ingredient quality is top class. Some might point out that “sugar” (typical white refined sugar) is used instead of agave or some other popular sweetner, but based on my research there is not sufficient evidence to prove any of these sugars is significantly more healthier than any other. Full ingredient list: milk, cream, sugar, black raspberries, chocolate, oil (coconut, soybean), dextrose, vanilla, carob gum, and soy lecithin. I bought this for around $2.99 at a Publix grocery store, half of its normal price due a weekly sale. For some reason I never see this flavor at my local Whole Foods Market, though it may be at others. Natural ingredients, great taste, and a reasonable price (even when its not on sale) make this a must try for any ice cream lover. For some reason I really enjoy making visual graphs from data, something which can give new insight into relationships hidden in the data. I decided to apply this hobby of mine to ice cream, and came with the above graph. 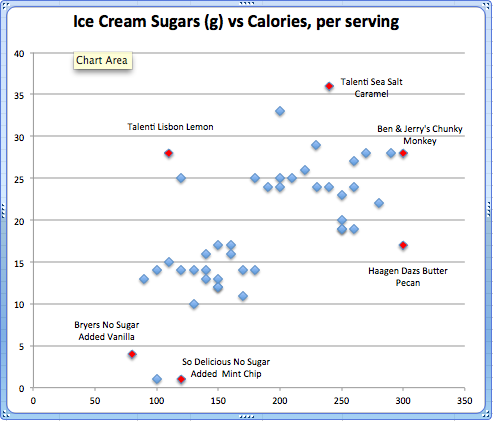 It shows calories on the horizontal axis, and sugars (in grams) on the vertical one. Numbers are measured against a single serving, which is typically 1/2 cup. I have captured data for around 50 products across 7 different brands, and highlighted some of the points on the graph. As expected, there is a general correlation between calories and sugar, since adding more sugar usually means adding more calories. However there are some cases like Haagen Dazs Peanut Butter Pecan, which has a lot of fat that contributes to calories, but not sugar. We also see the other extreme, Talenti Lisbon Lemon, where the main ingredients (besides water) are lemon and sugar, both which contribute to sugar but not to calories. I happened to find this product at the Morikami Japanse Museum & Gardens in Delray Beach, Florida, and decided to pick it up. “Choco Indulge Crunch” is my own translation. Literally translated, the title is closer to “Indulge in Chocolate! Crunch”. 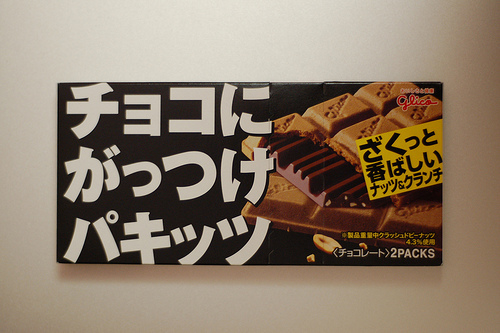 The translated English packaging calls the product “Pakitz<Nuts & Crunch>”, but I like my translation better. For those curious, “Pakitz” comes from the Japanese “パキッツ” which refers to the sound of something like a cracker crunching when bitten into. This product is made by Glico, a Japanese company, and imported by JFC International Inc. The two halves of this bar are each wrapped separately in sealed packs, which is a nice trend I’ve seen in other Japanese candies. One disadvantage of this, however, is that there is less actual candy that you would expect from the size of the package. 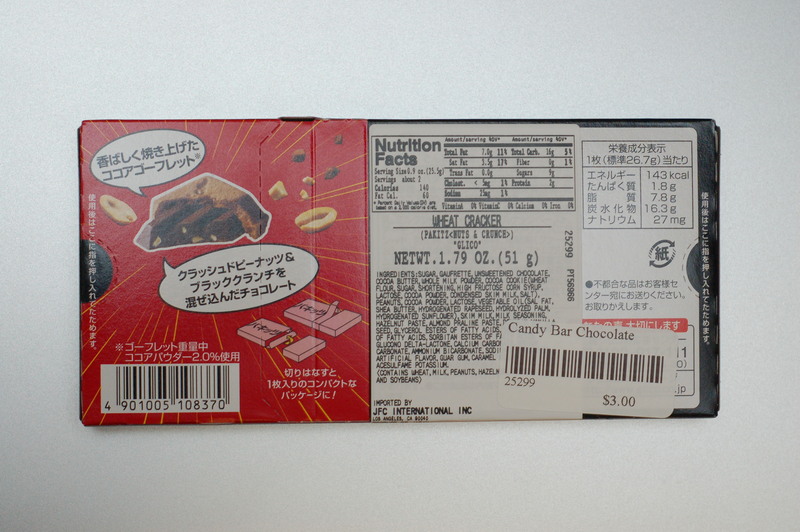 Like many typical chocolate bars, this product is separated into little rectangular nuggets which are connected together in a 3×4 array in each serving. The top half of each nugget is a ‘gaufrette’ wafer (see ingredients section below for details), with a mild taste and crunchy texture not unlike that used in many typical American cookies. The bottom part is made from pretty typical sweet chocolate, which tastes as if it has a low cocoa count (around 50-60%). It has some small peanut slivers in it that give it a mild crunch. The picture on the front of the wrapper, shown in the picture at the top of this post, gives a good idea of what both parts look like. This bar does an excellent job of fulfilling my requirement of two or more contrasting flavors and textures, and the end result is quite different than anything I’ve had before. If I had to compare, I’d say that it’s a distant cousin of the classic KitKat bar. One serving is 25.5 grams and there are two servings per package. In one serving there are 140 calories (60 from fat), and 9 sugars. This is definitely below average for this type of product. Unfortunately the ingredient list is quite long and contains a few suspect items, such as high fructose corn syrup, caramel color, acelsulfame potassium, ammonium bicarbonate, and artificial flavors. This product is clearly not marketed at those concerned with natural and safe ingredients. Ironically, the text above the manufacturer’s name says “taste and health” in Japanese. The first ingredient is sugar and the second is ‘gaufrette’, which is defined online as “a wafer of crisply fried potato cut to resemble a small waffle”. However, if you look at the original untranslated ingredient list (in Japanese), it contains flour, starch, sugar, chocolate, vegetable oil, and salt as sub-ingredients of this item. The term “wheat cracker” is also used in the translated English text though it doesn’t taste like a typical wheat cracker to me. This product also contains several types of nuts – peanuts, hazelnuts, and almonds, but they contribute more to texture than taste. For the entire list (in English), see the image at the bottom of this post. I bought this at the Morikami Museum’s gift shop for only $3.00. Since this is an imported product I consider it a pretty good price, equal if not cheaper to something domestically produced. One reason for the low price is that the wafer portion is very light (filled with air) and so there is a bit of filler. For those who want to learn more about the Morikami museum you can check out my review of it here. This Japanese import candy has a unique texture and flavor, but several debatable ingredients make it hard to recommend to those who are concerned about the safety of the ingredients they consume.